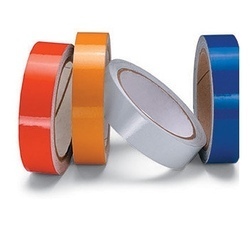 Available with us is a wide range of Industrial Tapes that have different stationery uses and other uses. Being the most economical item in our range of tapes, these BOPP tapes that are applicable for packaging easily printable base, wrapping gift articles, sealing cartons, stopping pilferage, mark of forgery proof and many other areas. 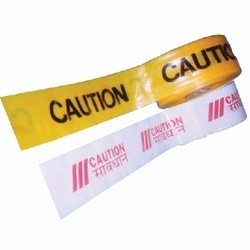 We are involved in manufacturing and supplying of Caution Tapes that are also known by the names of warning tapes or police tapes. They are widely used to mark or segregate accident-prone area in a factory, warehouse, construction site or other place. Besides this, these are also used by traffic police as a traffic sign. We offer these tapes in a signal color or highly contrasting color combination like yellow or black and red or white. We offer high quality Reflective Tapes that are useful for people with poor night vision. At night, it is difficult to locate things or identify obstacles in our path. For such reasons, these reflective tapes are very useful and are highly appreciated by our clients. 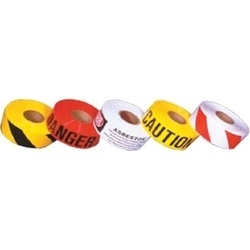 Barricade Tapes are used in industries and manufacturing units to barricade danger zones and ensure safety of personnel and staff.These are an ideal for warning or danger cautious area which prevents you from any accident prone area. Barricading tapes are widely used on roads to show maintenance, work in progress, no parking, no entry etc. We are one of the leading manufacturing, exporters and suppliers of Floor Marking Tapes from our impressive array of Safety Equipments. 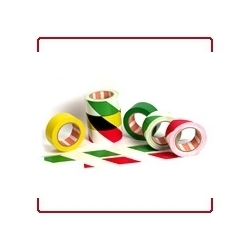 These are extensively used for color-coding, safety-coding, or indicating potentially hazardous area and also as adhesive tapes for putting different parts together for transportation and storage. These are available in variety of vibrant colors, widths and lengths. These have outstanding holding capacity yet can be removed without damaging the surface and are abrasion, snagging, impact and scuffing resistant. stocks a variety of widths & lengths. Color-coding of equipment and devices.